We're pleased to have Pickles, the CEO of her own cat accessories company, and a self proclaimed fashionista, here to offer her chic Valentine's Day gift picks. 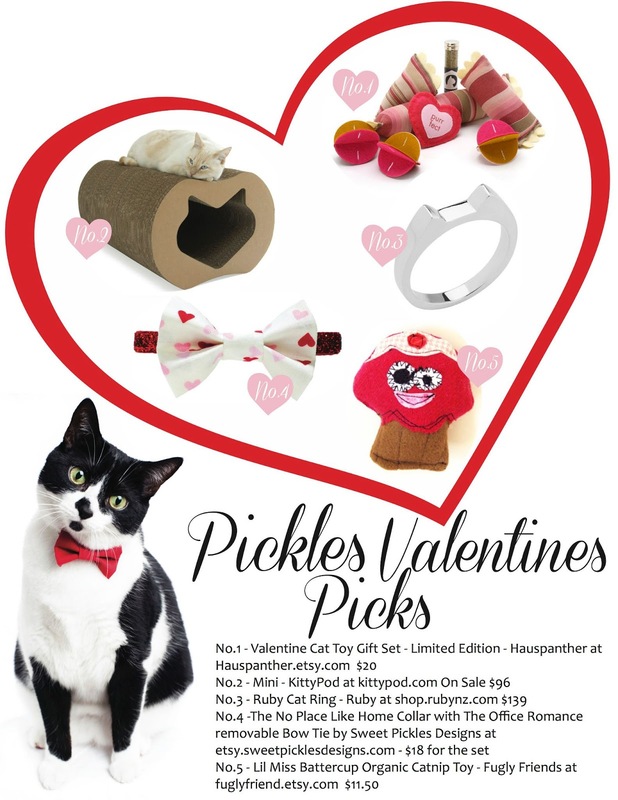 The smart young executive started Sweet Pickles' Designs in 2010, when she realized there was a market for cat couture. The idea came to her when she couldn't find anything stylish to wear. Her dog siblings were more fashionably dressed than she was! She didn't raise a paw to complain. No. She went straight to the drawing board. Pickles "took on the cat fashion world and started her own label so she too could express herself." The busy CEO, a rescue cat, loves hanging out with her 3 dog siblings, pets, playing fetch, going for long drives, treats, picking out new collars, rolling on the bed and licking dirty dishes. Thank you for sharing your impeccable gift picks, Pickles! photo credit: Sweet Pickles' Designs used with permission. Wow, Pickles sure has good taste! We have to get the mom and the dad to visit Pickles' company! I would also like a ruby cat ring. It is so exciting to meet pickle.